Finally, the Whole Picture -- and One of the First 250 Struck! 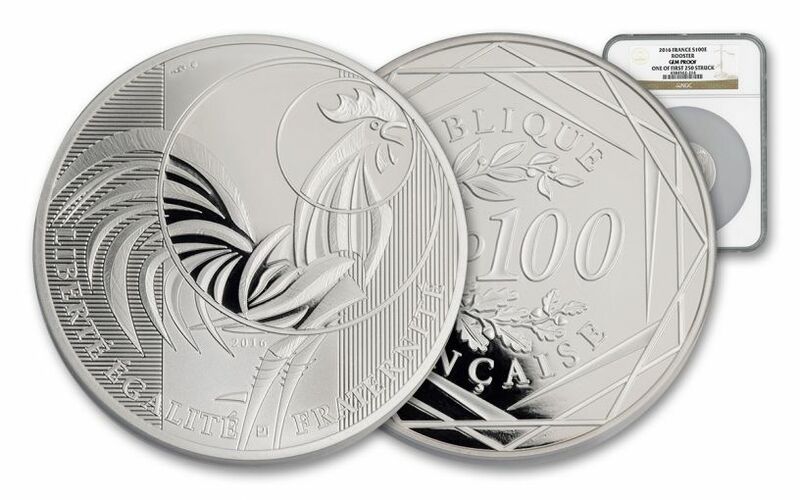 In 2016, the historic Paris Mint struck the last in a series 100 Euro Silver Roosters. This example grades Gem Brilliant Uncirculated by Numismatic Guaranty Corporation (NGC) and is encapsulated in a holder with the designation that the coin is "One of the First 250 Struck." Minted in 90% silver, the coin weighs in at a hefty 50 grams (about 1.6 ounces) and is 47 mm in diameter -- quite large indeed! 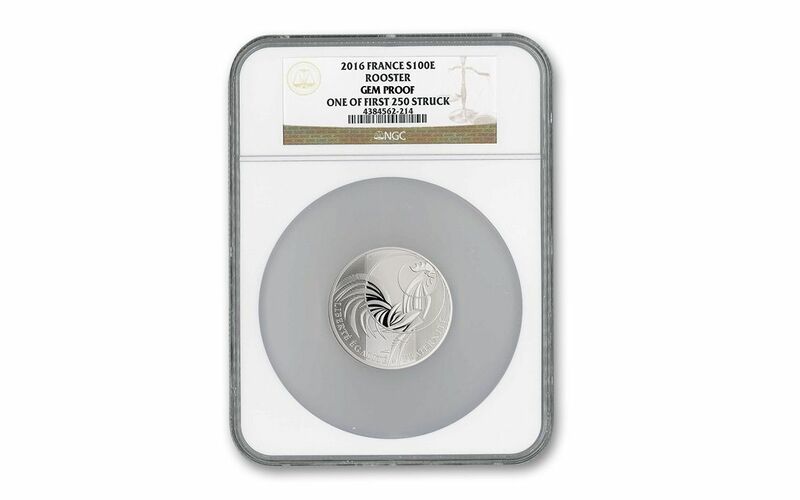 The three-coin Silver Rooster series started in 2014 showing the head of a rooster. 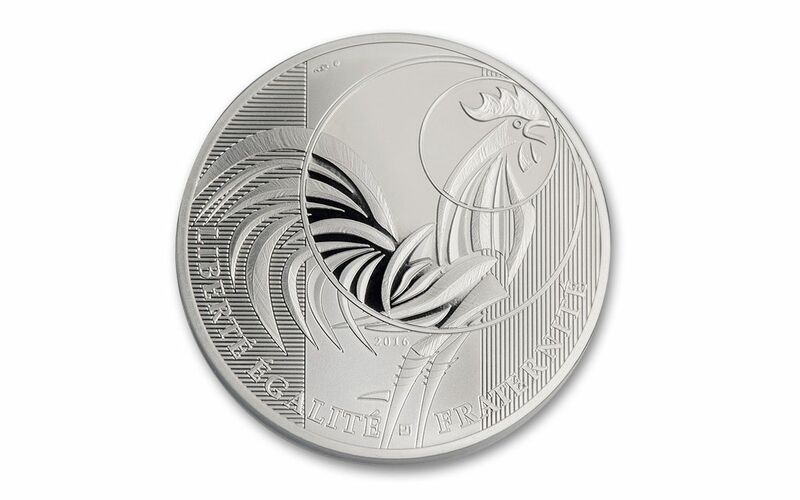 The 2015 example revealed more of the bird, and now the rooster is seen in its full glory on the 2016 coin. This coin has three hallmarks on the obverse. The square hallmark is from the designer, Joaquin Jimenez. 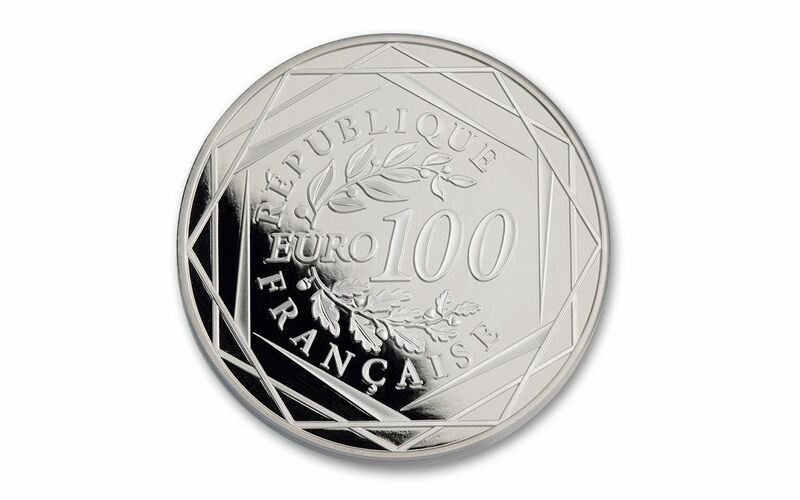 Joaquin designed the obverse of the 1991 Coin of the Year Award winner, a 1989 5 Franc coin commemorating the 100th Anniversary of the Eiffel Tower. Also included is a Horn of Plenty -- the symbol of Monnaie de Paris (The Paris Mint) since 1880, signifying the coin was struck in their factory. The other small hexagonal shape is for the engraving workshop and means this Silver Rooster was designed internally. The reverse shows the face value surrounded by two branches (oak & laurel) that evoke the Euro symbol. The entire reverse motif is framed in a hexagonal design representing the shape of France. Collectors actively seek out the last coin in any series, and with the added first strike designation and high face value, this last coin becomes even more desirable. Don't miss this opportunity to add it to your collection!